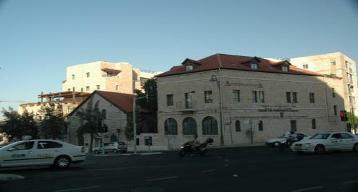 Fuchsberg Center for Conservative Judaism - home of The Conservative Yeshiva where I am studying. What a wonderful first few days I have had here in Israel. My trip here was fairly uneventful once I managed not to miss my plane from Atlanta to Tel Aviv despite Delta trying really hard to make sure that I did! The flight did not seem 11 hours long, the attendants were lovely and I had two seats and so was able to sleep fairly comfortably. The flight attendant who made the announcements was Israeli and made them in both English and Hebrew. When he made the take off announcement in Hebrew he added in “This plane is going to Tel Aviv, if that is not where you were planning to go, too bad you’re stuck now.” This of course set apart the Hebrew speakers from the non-Hebrew speakers on the plane and got a good laugh as well. The arrival at Ben Gurion airport was amazing. Coming in and looking out at Israel was really powerful – even if it was all dry and brown and mostly industrial around the airport. Processing was quick – I was through passport control, had my luggage and on a Sherut (shared cab or shuttle bus) to Israel in less than 20 minutes after deplaning. Things slowed down after that as we sat for 25 minutes in traffic due to a roadblock – most likely security related though we never did find out for sure. The ride to Jerusalem was nice, got to know some of my fellow passengers, one used to live in Seattle before becoming religious and making aliyah (moving to Israel permanently). The scenery was also wonderful, particularly coming into Jerusalem. We passed some check stations, many walls along the highway (never sure if these were “the wall” or just the same kinds of walls that we put up along highways – the concertina wire at the top of some was a clue they might be a tad different). I am really working on getting over my aversion to guns and realizing that Chai’alim (soldiers) with Uzis everywhere are a good thing and are why I can be here and feel safe. And, when I say everywhere, I mean everywhere. There was one last night at the restaurant where we ate dinner – in uniform with his (presumably unloaded) gun. One of the women in my group who lived here on a kibbutz in the 70’s and was involved in a terrorist attack then told me that I should be thankful they are around and get over my aversion. I do feel safe – this restaurant also had an armed guard who searched your bags and then opened a locked metal gate to let you into the restaurant. We were told to only eat in places with guards and most around my apartment do. The shomer (guard) at the synagogue I went to on Saturday had a loaded pistol and an extra clip of bullets – as Steve was on door duty at Beth Shalom that morning I asked him if he also had a pistol! So glad that we do not need that in the US. Another thing to get used to, I am reminded as a car alarm goes off outside, is the noise. I live near Emek Refaim, a busy commercial street, and it is almost constant. I did wake up at 5:15 am yesterday and was shocked at how quiet it was but it started up again soon after. People are out until well after midnight and horns are honked constantly, car alarms go off and other noises. Today is Tisha b’Av, a fast day and day of mourning, and it is really quite quiet out. Most of the places of business are closed – any kosher eating or shopping establishment is required to be closed, as people shouldn’t need food today. I haven’t been out to see if other stores are open. We do not have classes so it is a chance to do a little shopping (of the window variety and otherwise). There are some amazing stores near me with beautiful Judaica and jewelry. One of Israel’s most famous jewelry designers has a shop 2 blocks from here. I think that Jerusalem, or at least the neighborhood where I am staying, could give New York or Paris a run for her money as the city that never sleeps. On the second night I was here which was Friday, I went to the Kotel (western/wailing wall) after Shabbat dinner with some of my new friends. It was a long walk and we wound our way through the old city to the Wall. There were lots of Orthodox Jews out enjoying the cool evening air after their dinner. We finally made it, through security and down to the women’s section of the wall. It was an amazing experience, especially on my second day and Shabbat. There weren’t many people there (it was 11pm) but the women who were there were deep in prayer and many crying. It was so moving. The cracks of the wall were filled with notes and prayers and doves (and/or pigeons) nested in the rocks as well. I stood with a hand on the wall, said a prayer, and then slowly worked my way backwards away from the wall (this is customary, as one does not turn ones back on a holy object such as the Torah). I think all of us who went were a bit overcome – and if we weren’t then we were by the time we had walked back home (quite a ways and up and down some serious hills). The views were amazing as we were walking as we could see the lights of homes in the valleys around Jerusalem as well as Mt. Scopus cemetery on the hills opposite. All in all an amazing night. Saturday morning I went to services as Shira Hadasha (http://www.geocities.com/shira_hadasha/) which is an Orthodox minyan that researched Halacha (Jewish law) to find out what exactly were the limits on women’s participation in the service. While there is a mechitza (dividing curtain) and men and women sit apart, a woman led P’sukei d’zimra (psalms that start the service), the Torah service, read Torah and Haftarah (prophetic reading) and several were called to the Torah for aliyot. There was a female Gabbai Rishon as well. The curtain was pulled the whole way back when the d’var (sermon) was given and at the end for announcements. It was not removed for the Torah reading and how they worked this is amazing. Lots of scooting the reading table back and forth depending on the gender of the person having the aliyah and/or reading. While I am not a fan of women being separated and put behind a curtain, I have to say that this felt very different and I was not unhappy. The services were beautiful – lots of gorgeous singing – and went quickly. They did a full service, full Torah reading with individual blessings for each aliyah, a lengthy d’var and were done in 2.5 hours or less. There was no wasted time. Sunday classes began and I got to meet some more of my fellow students. I had already spent a fair amount of time with Yeshiva Cohen, a young woman from Connecticut who teaches Kindergarten and Randi who is also from Connecticut and teaches at her synagogue school. I have gotten to know a number of other people fairly well at this point including Rachel Braude who is from LA and was bat mitzvahed by Dov Gartenberg!! Jewish geography is always fun and I have met lots of people who know lots of other people who I know. Classes have been mostly good. I am in level Gimmel of Ulpan which, despite being the 3rd letter of the alef bet, is the 4th level of Ulpan(intensive Hebrew – 3 hours a day). I was a bit concerned but so far am holding my own. The instructor, Mihal, is great - very nice, patient and helpful. We are discussing the difficulties of being a new olim (immigrant) to Israel and really anywhere. The other classes are interesting, I am really only unhappy with one but since we have only had once session am willing to give it at least one more session before I look into changing. I have met so many interesting people and am enjoying getting to know some of them better. There are always people willing to go get dinner or do something after classes, which is nice. I was a bit depressed when I got here and, while I still miss home, having so many new friends eager to do things has really helped. As I was warned, outside of Ulpan, there really is little need for Hebrew. I am often shocked after spending time speaking English to look around and see all the signs in Hebrew and be reminded of where I am. Every place I have gone to eat has had menus in both languages and last night we were given one only in English. I try to speak Hebrew but usually am responded to in English or quickly find myself needing to revert to make myself clear. I try to use as much as I can and am actually happy to be forced to use it as with our cab drivers last night. Last night began the Fast of Tisha b’Av as I mentioned above. I went to the Kotel with a group from the Yeshiva for services and reading of the Book of Lamentations (Eicha in Hebrew). One of the things that really gets my dander up here is the fact that I am not able to pray as I normally would at the Kotel proper. There is a women’s section but if I would be risking bodily harm (no, really) if I was to go there and put on a tallis and tefilin to pray in the morning. This has been a many year battle for women who live here and are less traditional. The Masorti Movement (the name of Conservative Judaism outside the USA) in the last year or so arranged to have access (pre-arranged, not 24/7 like the Kotel) to an more recently unearthed section of the Western Wall known as Robinson’s Arch. It is to the south and on a lower level than the Kotel plaza. I was not happy about being stuck off in a corner but once we got there, I was actually pretty excited about where we were. The area that we were in is a real archeological site with huge rocks sitting where they fell in 70 CE and the ruins of market stalls and other structures all around. To be sitting on the rocks that were there to witness the destruction of the Second Temple in 70 as we were mourning the loss of that Temple was AMAZING!! My tuchis was sitting on what was most likely the floor of a market stall then! How amazing is that? So, while the existence of a separate Kotel Masorti (as this area is referred) is an official “screw you” from the Orthodox in my opinion, it is actually a pretty amazing place to go and pray, particularly on Tisha B’Av. I look forward to getting to go and pray there again when it is open to us. That is about the extent of my news from here. So many experiences and feelings that it is hard to put them down. I have been keeping a journal and so that will help me to recall them all. I have tried to put as many down here as was reasonable. Not sure that each week will be so full of amazing things but we are going on an archeological dig on Friday so that should make for some good stories. Until my next post, be well.